Due to the overwhelming response from our friends, family and partners, we are now expected to reach 100% of our moving costs right around the end of 2013!! Because of this, SIM has given us the green light to begin researching flights for the first or second week of February to move our family to Kenya! As of January 1st, we will come on salary with SIM and Clinton will be able to transition to only working part-time with the County. This means in January we can focus on the logistics of moving and making final preparations! Lastly, we are now at the point of only needing around 12 additional monthly partners to reach 100% of our monthly goal!! Isn’t God faithful? 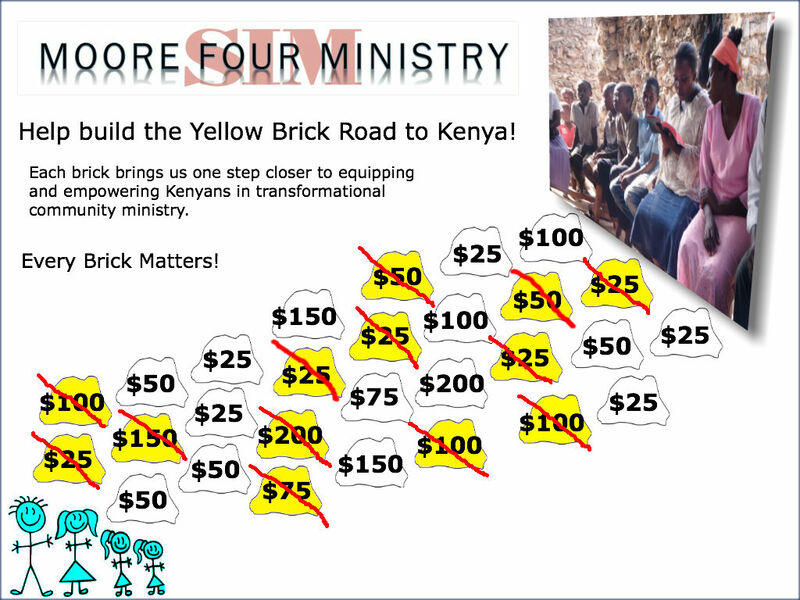 People have been asking us how this breaks down, so, we have created our “Yellow Brick Road to Kenya.” (See picture below). This is just a simple illustration of how much we have left to go before we can click our heels, as it were, and at last arrive in Kenya! If you are interested in more information about the ministry and what exactly God is doing there and our part in it, click here. If you want to have a hand in expanding this incredible, life-changing ministry then just click here and grab a brick! Please let us know via email which one you have decided on or if a different amount works better. We would like to know by January 7th so we can continue with securing our plane tickets and making additional preparations. Also, please feel free to share our Yellow Brick Road with anyone you think would be blessed and interested to hear about this powerful ministry. We would be happy to meet with them.